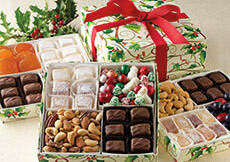 A selection of our best-loved candies! 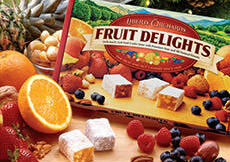 We've taken our orchard fresh Fruit Delights and lovingly hand-packed them into our square gift boxes. 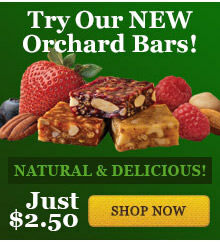 Flavors include Strawberry-Walnut, Blueberry-Almond, Pineapple-Macadamia, Peach-Walnut , and Orange-Almond. Kosher. 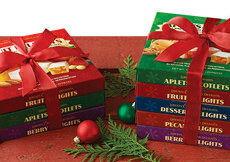 Also available in the three or five box stacks. 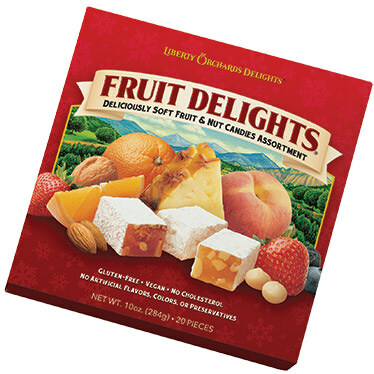 INGREDIENTS: sugar, corn syrup, nutmeats (walnuts, pecans, almonds, macadamias, cashews), modified corn starch, fruit [fruit juice from concentrate (strawberry, peach, blueberry), candied orange peel, pineapple], pectin (pectin, disodium diphosphate, sodium polyphosphate, dextrose, dicalcium phosphate), natural flavors, sodium citrate, citric acid, malic acid, soy lecithin. These are really great. I've ordered them twice and will do so again. They are sweet and nut-crunchy, and the fruit-nut combinations are very good.